I remember the feeling of being depressed so vividly. I remember not being able to get out of bed. I remember feeling constantly tired and achy. It was difficult to recover from but I did it. While I still have to proactively manage my mental health I no longer struggle with depression on the day to do. Recovery can seem like a daunting journey when you’re depressed and I know it can feel impossible just to get started. I put together this list of easy things to do when you’re depressed to help you get started. Just pick one or two of them to do at first. When you’re done come on over to the mental health support Facebook group and post about what you accomplished so we can celebrate with you. Drink Water: Challenge yourself to drink lots of water throughout the day. I usually divide my weight in half and then try to drink that amount in ounces. Drinking water is a simple thing you can do for your body even if you’re tired and having a hard time doing anything. Eat Healthy Food: I know when I was depressed I never felt like making myself food. Try to think of something healthy you can get or make for yourself. If you live in a city you can probably even get a healthy meal delivered. My favorite healthy things are poke bowls or fresh juice. I used to feel guilty for spending the money to buy healthy food but now I know it is really important to managing my mental health and I make it a priority. Sit In The Sun: This is my favorite activity to do when I feel really awful. Sunshine can actually help with symptoms of depression and it’s free. If it’s a nice day put a blanket out on your yard and just go lay outside for a while. Go For Walk: I’ve been really into walking my dog around my neighborhood lately. Make yourself a playlist of all your favorite upbeat songs and go for a walk. If you’re feeling really crappy you can just go to the end of your street and back. Getting any kind of movement when you’re depressed is really good for you and you should feel good about any activity you’re able to get yourself to do. Do Gentle Yoga: You can find some of my favorite yoga routines for depression here. There are tons of free tutorials on YouTube and you’ll probably feel way better if you’re able to make yourself do a little yoga. It doesn’t have to be anything extreme. I usually just do a five or ten-minute yoga routine. Talk to a Therapist Online: If you’ve been following me online at all you’ll know I use and love BetterHelp. When I’m depressed or having a hard time the last thing I want to do is make an appointment and drive to a therapists office. BetterHelp lets me talk to someone from my house and it also gives me the ability to email my counselor if I don’t feel up to talking on the phone or video chat. Clean for Ten Minutes: When I was depressed cleaning my house felt like the most daunting task in the entire world. Set a timer and just challenge yourself to clean for five or ten minutes. Just doing a little bit can help you feel better and help you get some momentum to get started. If you want more tips on cleaning when you’re depressed check out this blog post. Call a Friend: I often have phone dates with my friends that live far away and it’s really nice. If you have any old friends you’ve lost touch with reach out to them and see if you could chat on the phone later. Most of the time I don’t want to talk to my friends about my depression but just having someone to chat with and talk about life can help me get out of my head. Watch Standup Comedy: I love watching standup comedy when I’m in a terrible mood. It can really distract me from how terrible I feel and offer a little break from feeling so down. There is tons of free stand-up comedy you can stream on YouTube or on Spotify. Make a Vision Board: This is my go-to craft when I’m in a bad mood. Sometimes just the act of creating something when I feel really low can help me feel a little better. I really enjoy the process of finding all the perfect pictures to add to my vision board. If you’ve never made a vision board before check out the video below about how to make one. Watch Panda Videos: I really love watching videos of baby panda’s on YouTube. You can pick any cute animal you want but pandas are my favorite to watch. There are tons of compilations of cute and funny animal videos on YouTube and when I’m having a really hard time I will kill a bunch of time just watching baby pandas and cute puppy videos. 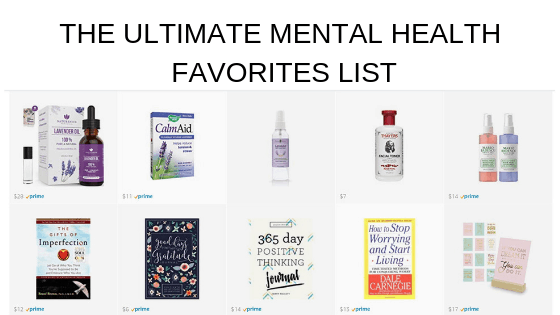 Start a Mental Health Blog: Starting this blog has been one of the best things I’ve ever done for my mental health. Feeling like I can use my experiences to help other people struggling with depression and anxiety has given me a purpose and I love feeling like I could help someone else. I also feel less alone because I get to connect with so many women who are on a mental health journey on my Facebook and Instagram accounts. Take Yourself Out: When I’m depressed I tend to isolate myself and stay in my house for days at a time. Take yourself on a date to get yourself out of your house and out of your routine. I like to go to a coffee shop and write in my journal or read a book. You can also go check out the library where you live and spend a long time finding the perfect book to check out. I also like to take myself out to lunch and spend the afternoon working on my laptop. Listen to Something Positive: Listening to positive podcasts and audiobooks has really had a huge impact on my mental health. When I get depressed my thoughts are all really negative and listening to positive messages helps me get a break from my terrible inner dialogue. If you’re not sure what to listen to be sure to check out my podcast and book recommendations. Take a Long Shower or Bath: If you are not feeling well go soak in the bathtub or take a long shower. This is one of my favorite activities when I’m depressed and when I was really struggling I would take multiple baths a day because it was one of the few activities that made me feel better. I like to soak in Epson salt and listen to podcasts in the bathtub. Make Gratitude Lists: As I said, when I’m depressed my thoughts are negative AF. I used gratitude lists to show my brain that there are blessings surrounding me all the time. After lots of practice I have become way more positive and I think a huge reason why is because I write gratitude lists all the time. My brain is always looking for things I can add to my gratitude list as I go through my day. I have a podcast episode about how I became more positive you can check out below. Make a Dr. Appointment: I put this off for so long when I was suffering from depression. One of my biggest regrets in life is not going on anti-depressants sooner. I know everyone’s experience with medication is different but I just want to share my experience in case it helps someone else. I suffered from untreated clinical depression for ten years before I talked to a doctor and got on medication. It makes me really sad to think about all of the experiences I missed out over all those years I was suffering from depression. 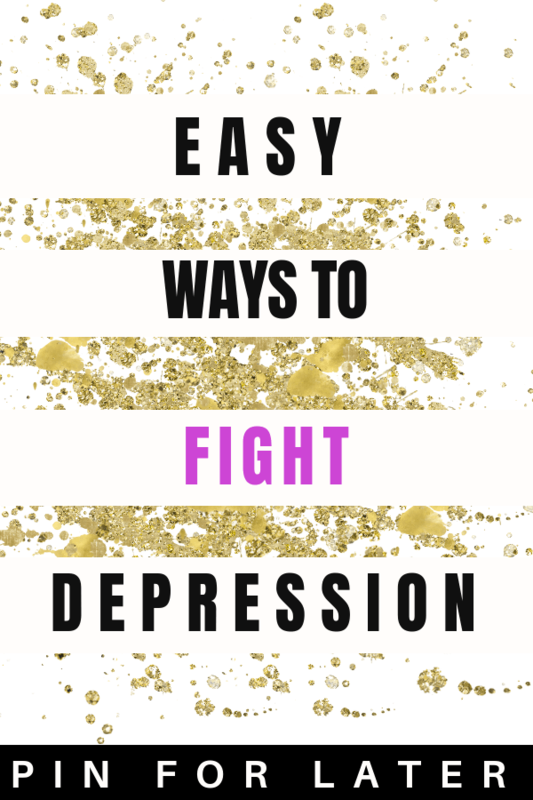 Looking for more ways to fight depression? Check out my other blog posts here. Want to remember these tips? Pin this post to your favorite Pinterest board!